I really love this idea - Chalkboard contact paper! No need to paint things - just slap some of this wherever you like and it becomes a chalkboard! Would be great for labels on mugs or bottles, on a child's tabletop, on the side of your cabinet or fridge, on the side of a dresser, an old full-length mirror, sliding closet doors, a picture frame for a portable chalkboard, even on the wall of your child's room! What great ideas could you come up with??? • Tough, durable and repels stains. Wipes clean easily. • It's easy to apply, easy to remove and easy to keep clean. • Features an easy-to-peel liner and an adhesive that allows it to be repositioned during installation without leaving a sticky residue. • Simply cut to length or shape for a custom application. NOTE: Most chalkboards come with instructions that say to color (with chalk, obviously) all over the board and then erase it before the first time you try to use it for real . Do this! 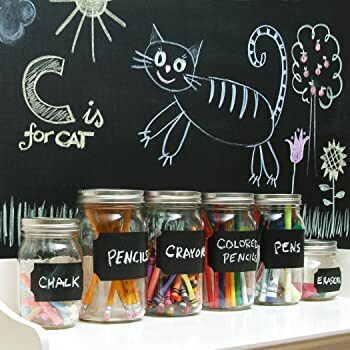 Rub with the side of the chalk (evenly and lightly will do it) all over the board - and then erase it using a regular felt chalkboard eraser, DRY paper towel, or similar. This makes chalkboards take the chalk much more smoothly. You may have to repeat this step one more time, but after this, you will find that the chalkboard paper does in fact work JUST LIKE a REAL CHALKBOARD!! Kim Foster posted: Love this !!! Thanks for posting. I liked the idea of chalkboard paint and was going to add it to my long list of projects. Truthfully I just don't have the time. This is a great solution to the sticky tac situation I've been having with my two little monkeys. Jillian Bigelow Carr posted: As long as your wall is smooth, this does work great. I put it on a door for my kids, and they still use it occasionally. Tina Killion Bailey posted: Have to get some!!! Juli Oswalt Johnson posted: This is awesome! Thank you! Shannon Bevan Sanders posted: Love love LOVE this! I love this idea but I found it cheaper than amazon plus i earned cash back!